All the tender joy of ribs without the bones! In a 2-inch deep baking dish, layer the onion slices. In a large resealable bag, combine the garlic, vegetable oil, brown sugar, mustard, chili powder, salt and pepper. Add the pork ribs and toss to coat. Place the ribs on top of the onions and pour the apple juice into the pan. Cover with foil and bake for 3 hours. Prepare grill (or turn oven to broil). Remove ribs from baking dish. Strain cooking liquid, reserve one cup. Grill or broil for 2 minutes per side. If broiling, place on a foil lined baking sheet. In a small saucepan, combine the barbeque sauce and reserved cooking liquid. Cook over medium heat until slightly thickened, about 10 minutes. 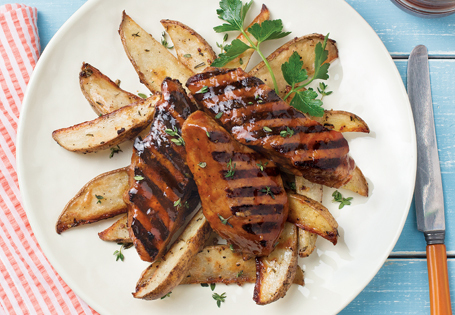 Serve ribs with sauce over rice or potato wedges.